Bloomfield Hills (MI) Brother Rice wide receiver Grant Perry committed to Michigan on Tuesday. He had previously been committed to Northwestern, and he also had offers from a bunch of MAC schools and Nevada. Perry is a 6'0", 180 lb. player who caught 105 passes for 1,727 yards (15.3 yards/catch) and 20 touchdowns as a senior in 2014, and he added a 61-yard punt return for a touchdown. Perry was all about Michigan for the entire recruiting process, and he stayed in touch with the Wolverines throughout. A high school teammate of Alex Malzone - who committed to Michigan last spring - the two seemed nearly inseparable. In some respects, Malzone is who he is because of Perry, and Perry is who he is because of Malzone. Unfortunately, the offer didn't come for Perry, so he had to explore his MAC options and then finally earned an offer the Northwestern Wildcats, to whom he committed in December. It seemed to be an unsatisfying end to his recruitment. Michigan hired a new staff, and they pursued some higher-profile targets to no avail. Finally, on the Sunday before National Signing Day, head coach Jim Harbaugh called him up with an offer. Perry decommitted on Monday and then publicly announced his commitment to Michigan on Tuesday. Despite being a nondescript 3-star recruit with a fairly unimpressive offer list, Perry does offer some positive qualities. First and foremost, I believe, is his attention to his route running. He does a very good job of setting up defensive backs. He gets vertical and stacks the defender when possible, which allows him to get separation coming out of his cuts. He also varies the speed of his release nicely, which at times helps the route combinations develop and leaves the defender guessing. As a go-to guy who caught 105 passes, one has to assume that he has excellent hands. His film shows him adjusting well to the ball in the air and catching it from various angles, including coming down over the top of his head, which is the most difficult catch to make. I also like his quick feet and ability to shake defenders in tight spaces. On the negative side, Perry is probably closer to 5'10" or maybe 5'11", which is obviously not great size for a wideout. That also limits the potential weight he can carry, and while small guys can be good blockers, it does potentially limit whom he can block effectively. Perry also does not have ideal speed. He will be able to get separation from some defensive backs because of his route running, and he will be a mismatch for linebackers in the middle of the field because of his quickness and ability to change direction. At this juncture in the recruiting process, Perry is about the best that Michigan could fans could reasonably expect. That's not an insult, but Perry has somewhat limited upside because of his lack of size and speed. He's not the next Braylon Edwards or Mario Manningham. However, he compares favorably to former Michigan wide receiver Drew Dileo, who was a sure-handed target and returner. Dileo was also a non-descript 3-star who had offers from Tulane and Stanford, the latter of which is a tough academic school like Northwestern. Both players have in common that academics are important and their football IQ shows itself on the field. We have yet to see how Harbaugh will use his receivers in the offense, but Perry has some value as a possession guy, a 3rd down target, and perhaps as a punt returner. The New England Patriots have been an NFL blueprint for using tight ends and little slot guys (Troy Brown, Wes Welker, Julian Edelman, Danny Amendola) to work short routes and the middle of the field. There's also a potential situation where Malzone could be targeting Perry at some time, and their history together could prove fruitful on the field. Perry is Michigan's tenth commitment in the class of 2015 and the first wide receiver (California wideout Deontay Burnett is no longer part of the class). He is the second commit in the class from Brother Rice, and he joins a decent line of players from the school that includes end Paul Jokish, linebacker Steve Morrison, punter Ross Ryan, and long snapper Jareth Glanda. You gave Perry a higher grade then Burnett? I'm surprised; you're write up for Burnett seemed more positive. I feel like Burnett was more of a boom-or-bust type, whereas Perry is more likely to reach his potential because he seems to be a high-character kid who loves Michigan and will be working with Malzone. Burnett is a better athlete, but Perry's more of a sure thing, IMO. 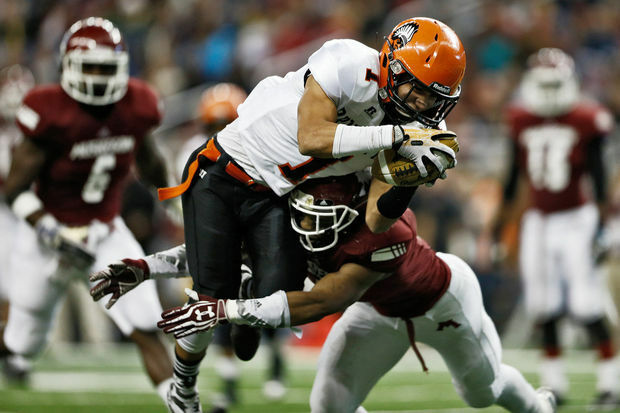 I would imagine every coach would like to have a receiver like Dileo in their back pocket. Yeah, having a stable of horses is needed, but that wiley little dude who just gets open is a nice thing to have. Well, every coach but Hoke/Borges since they gave more snaps to Williams, Kerridge, and tall WR who only played on run downs. It seems like Perry's upside is Dileo, but he's more likely to be far less. There were a lot of reasons to be excited about Dileo (special teams potential, high school production, LSU reportedly sniffing around) that are not there for Perry. There are more concerns too, given we don't know how much of it was a credit to Malzone, and that he's at a very well-scouted program. A LOT of people have passed on this kid. I see him as a special teams guy (not a returner) and potential depth WR (5th or 6th guy on the depthchart). He could be useful. But it would be surprise if he is as useful as Dileo. Especially if you assume Michigan will land superior talent at WR next year. The blocking concern is puzzling to me. I just haven't seen much correlation between size and blocking ability for skill position players. It's really the same thing as the arguments for not offering FBs scholarships -- the task is mostly about effort. I'm on the record as being skeptical of of both Malzone and Perry. Given the need at QB, Malzone made sense. But Perry is a guy even Hoke didn't want to offer. I know we're drawing near the end of the cycle but this is a long way from a Norfleet-caliber PLAN D.
Not that I don't want us to use the scholarships, but we don't really need WRs and Perry has the least impressive recruiting profile I can remember Michigan grabbing since probably Ray Vinopal. I would also argue we CAN expect more. Guys are getting flipped everyday. People like Barnett (who sounds FAR more appealing IMO) are out there. It seems like Michigan is conceding here, or at least picking their battles. The sky is not falling, but this feels like a setup. If I'm wrong, that's fine. I'll cheer for him alongside everybody else. This young man wanted to be here the entire time. He waited and was patient. These are the type of guys that WORK the hardest. BLOOD, SWEAT, AND TEARS for MICHIGAN - you need a couple of these hometown glue guys that are under the radar and not highly touted. They are always out to prove themselves - you need that chip on your shoulder attitude. They will do everything asked of them because they have dreamed of this moment for a long time. With Harbaugh, I think he will become so damn solid, and we be a great person to have on this team. He probably won't be a superstar, but he will be that guy who makes catches and moves the chains. (Just like Dileo) He is the type of player where you just smile when he catches the ball and has a nose for the first down marker. Teams won't gameplan for him, but by the end of the game, they will be wondering, what just happened, how did he beat us.